Economic integration and the Mercosur trade bloc were high on the agenda for discussion when new Brazilian President Jair Bolsonaro met with his Argentine counterpart, Mauricio Macri, on Jan. 16 in Brasília. Bolsonaro, who during his campaign had criticized Mercosur as a leftist political forum, is now expressing confidence that Mercosur can be “modernized.” What are the main ways that Bolsonaro and Macri might change the customs union, and what would be the effects on the economies of Brazil and Argentina? 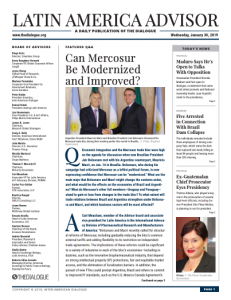 What do Mercosur’s other full members—Uruguay and Paraguay— stand to gain or lose from changes in the trade bloc? To what extent will trade relations between Brazil and Argentina strengthen under Bolsonaro and Macri, and which business sectors will be most affected?